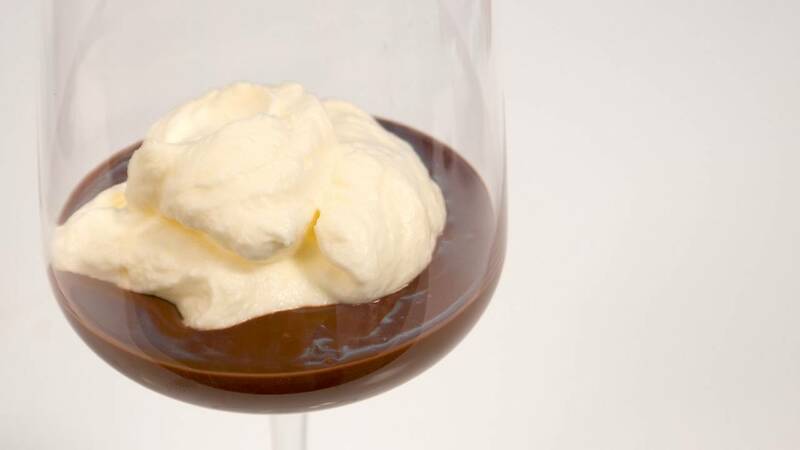 Video Recipe - The French chemist and molecular gastronomer Hervé This invented this recipe. It defies everything anybody knows about chocolate. Usually melted chocolate is completely destroyed if there is just a few drops of water added by accident. But in this recipe Hervé This used his knowledge of chemistry to make the impossible happen. If you use cream in the recipe, then add the sugar and whip it into ... whipped cream! 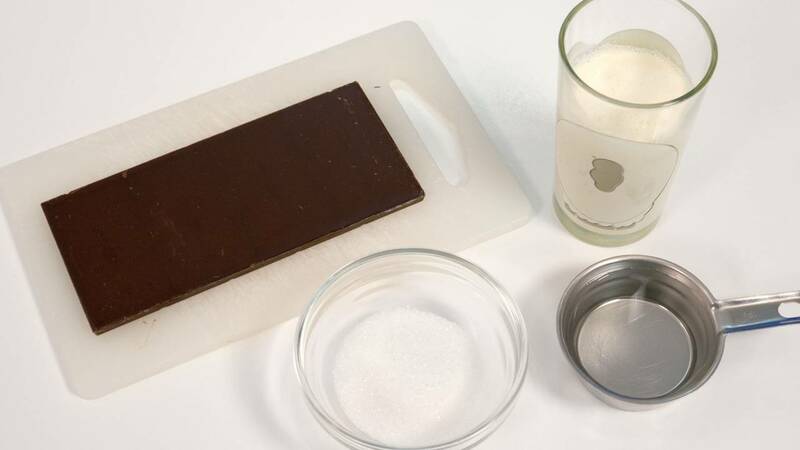 Chop the chocolate into ½ cm (1/4 inch) cubes. Put it into a bowl with fresh water. Take the bowl with chocolate and water, and put it into a water bath with hot water. The water should be hot enough to melt the chocolate. I just use hot water from the tap, but a pot of water that is heated also works. Stir until the chocolate is melted and the mixture gets a smooth surface. Remove it from the hot water. Put cold tap water into the water bath instead of the hot water. If you make a larger quantity then you can put some ice cubes in the water. Put the chocolate into the cold water bath, and stir until it becomes creamy. It should keep its shape when you take a spoonful. It is important not to cool it off for too long, as it becomes stiff and grainy. Then you need to melt in a water bath and cool it all over again. 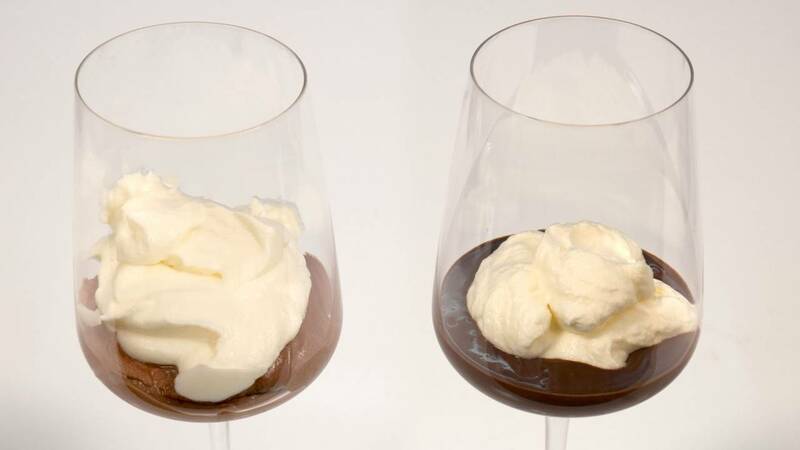 Put the mousse into serving glasses, put whipped cream on top. Mix the mousse with approximately the same amount of whipped cream. Pour into serving glasses and put whipped cream on top. With or without sugar whipped in. There is generally two possible combinations with this recipe. The simple chocolate mousse with whipped cream on top. It is very flavorfull and not that sweet. My favorite. 2. Chocolate Mousse blended with sweetened whipped cream and whipped cream on top. A larger portion. Less flavorfull. Sweeter. The kids favorite. You decide yourself how large the servings should be. As there is a whole bar of chocolate in it, I usually make 4 servings. The taste is so powerful that it is usually enough. This is best when served immediately. But if you do make it ahead of time you should just let it rest at room temperature. It becomes hard if refrigerated.